Strawberry Jam-filled Cupcakes with Cream Cheese Frosting | how 'bout some cake? Jason left for the casino again yesterday, which meant I had an evening alone. Obviously, I baked cupcakes. But not just any cupcakes- strawberry jam-filled cupcakes with cream cheese frosting. They taste heavenly, and they were super easy. Prepare the cake mix per the directions on the box. Pour batter into lined cupcake pan as you normally would. Set your kitchen timer for HALF the total cook time. 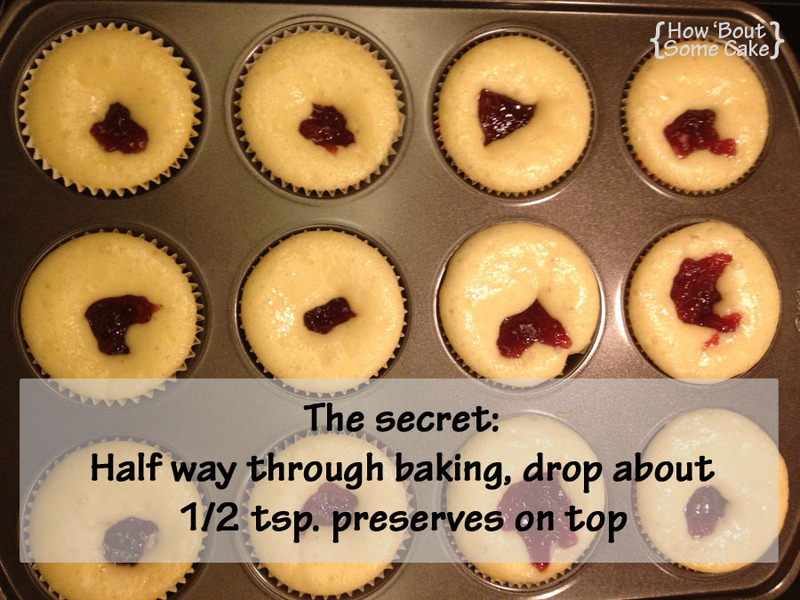 When the timer goes off, pull out the cupcakes and drop a little spoonful of preserves on top of each one. 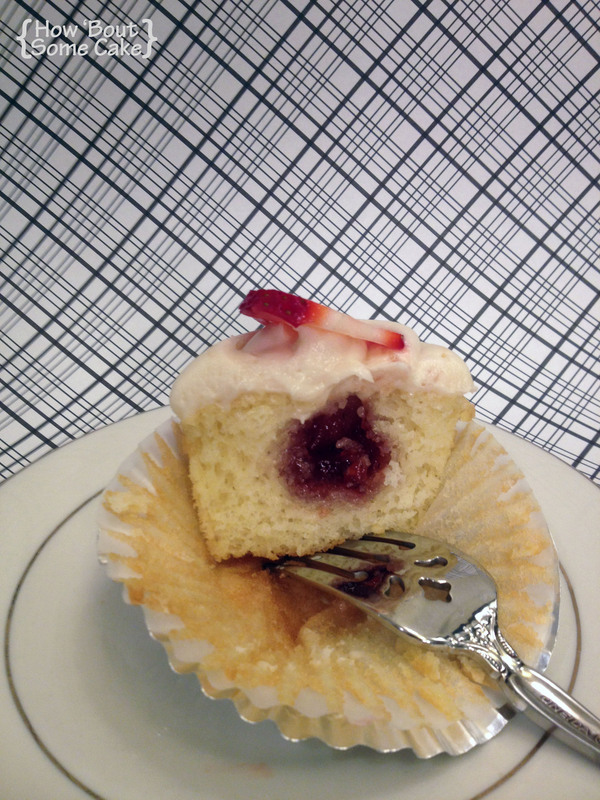 If the spoonful is too big, it will sink to the bottom and/or make the cupcake hard to eat. I found that about 1/2 a tsp. works perfectly. Put the cupcakes back into the oven for the remaining cook time. Mix the butter, cream cheese, vanilla, and sugar. This is much easier if the butter and cream cheese are room temperature. Once mixed, I put mine into a large ziplock bag and cut off the corner so I can neatly pipe the frosting onto my cupcakes. This entry was posted in Food & Recipes, Indulgences and tagged cream cheese, cream cheese frosting, cupcake, recipe, strawberry jam filled cupcake. Bookmark the permalink.